Mouse CD40, Fc Tag (TN5-M5259) is expressed from human 293 cells (HEK293). It contains AA Val 24 - Arg 193 (Accession # P27512). The protein has a calculated MW of 44.9 kDa. 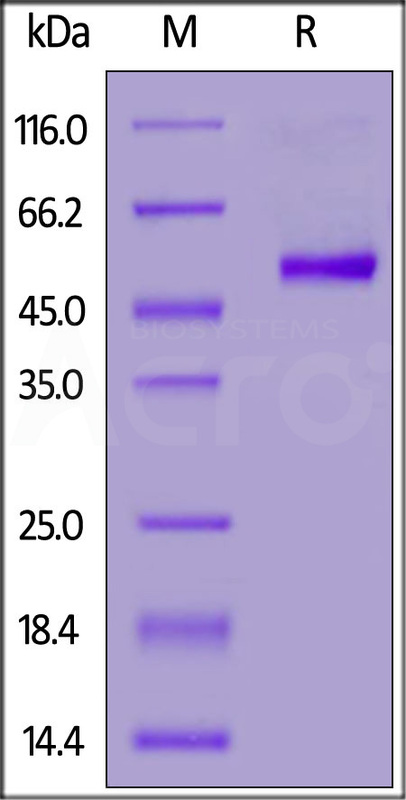 The protein migrates as 57 kDa under reducing (R) condition (SDS-PAGE) due to glycosylation. Mouse CD40, Fc Tag on SDS-PAGE under reducing (R) condition. The gel was stained overnight with Coomassie Blue. The purity of the protein is greater than 90%. Immobilized Mouse CD40, Fc Tag (Cat. No. 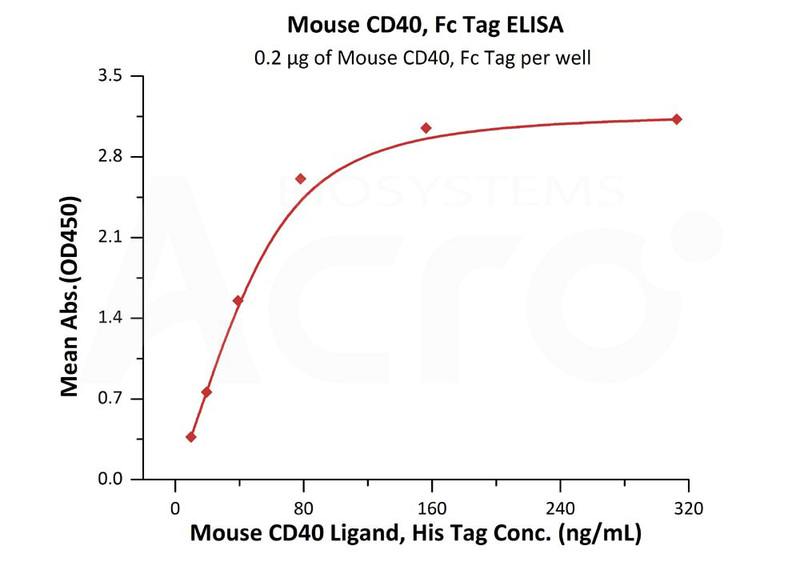 TN5-M5259) at 2 μg/mL ( 100 μl/well ) can bind Mouse CD40 Ligand, His Tag (Cat. No. CDL-M5248) with a linear range of 5-20 ng/mL (QC tested). CD40 is also known as TNFRSF5, Bp50, CDW40, MGC9013, TNFRSF5 and p50, is a member of the TNF receptor superfamily which are single transmembrane-spanning glycoproteins, and plays an essential role in mediating a broad variety of immune and inflammatory responses including T cell-dependent immunoglobulin class switching, memory B cell development, and germinal center formation. CD40 is a costimulatory protein found on antigen presenting cells and is required for their activation. The binding of CD154 (CD40L) on TH cells to CD40 activates antigen presenting cells and induces a variety of downstream effects. CD40 contains 4 cysteine-rich repeats in the extracellular domain, and is expressed in B cells, dendritic cells, macrophages, endothelial cells, and several tumor cell lines. The extracellular domain has the cysteinerich repeat regions, which are characteristic for many of the receptors of the TNF superfamily. Interaction of CD40 with its ligand, CD40L, leads to aggregation of CD40 molecules,which in turn interact with cytoplasmic components to initiate signaling pathways. Early studies on the CD40-CD40L system revealed its role in humoral immunity. Defects in CD40 result in hyper-IgM immunodeficiency type 3 (HIGM3), an autosomal recessive disorder characterized by an inability of B cells to undergo isotype switching, as well as an inability to mount an antibody-specific immune response, and a lack of germinal center formation. (1) Banchereau, J. et al., 1994, Annu. Rev. Immunol. 12: 881-922. (2) Ni, C.Z. et al., 2000, Proc. Natl. Acad. Sci. U.S.A. 97: 10395-10399. (3) Ferrari.S. et al., 2001, Proc. Natl. Acad. Sci. U.S.A. 98: 12614-12619. (4) Bhushan, A and Covey, L.R. 2001, Immunol. Res. 24: 311-324. (5) Armitage, R.J. et al., 1993, J Immunol., 150 (9): 3671-3680.